Her smile melted hearts, and Americans saved her life at the height of war. Now 11, the Iraqi girl heads to another faraway land to face another crisis — with hope. Noor's father cradles her head, shaven clean of a gush of black hair. "Baba! Baba!" she screams. "Don't let go. Don't let them take me." Her voice bounces down the outdoor corridors of a remote hospital as nurses rush the gurney toward an operating room. She clutches her father's hands as though she will never see him again. It is not an easy scene for me to witness. After reporting on Noor and her father for more than a decade, I've grown attached; it's almost as though I am watching my own family suffer. Noor al-Zahra Haider bears the double misfortune of being born with a life-threatening defect in a land torn by war. 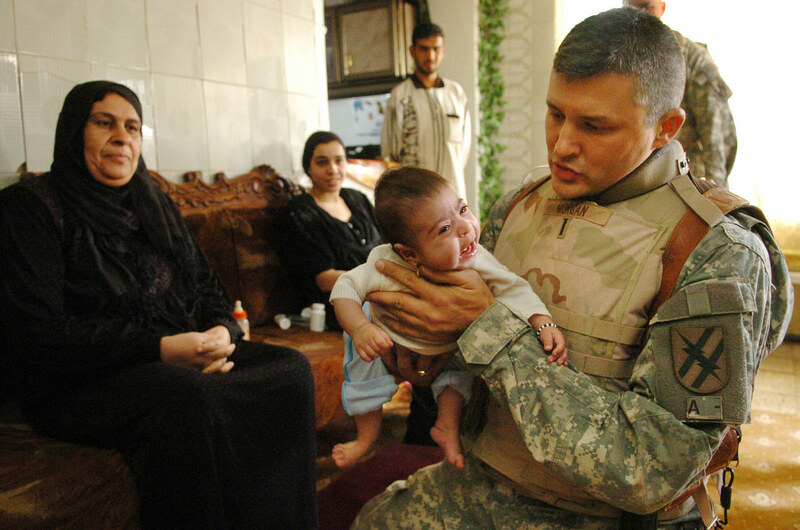 She was saved by an unlikely encounter with American soldiers and called Iraq's miracle baby. By all measures, it's remarkable the 11-year-old has lived to see this day. Noor's spinal cord did not fully form at birth, a congenital condition called spina bifida. She has no movement or any sensation below her waist and is prone to excessive fluid buildup in her head. 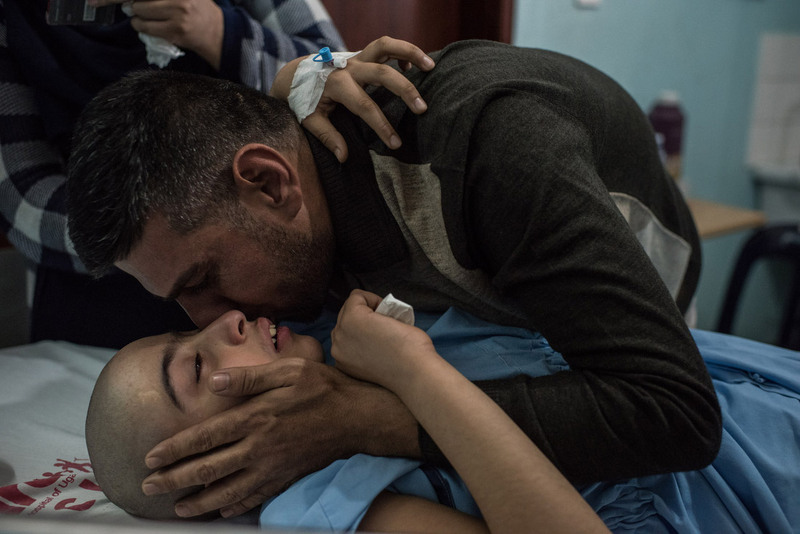 Haider Khalaf al-Tamimi kisses his daughter, Noor, before her surgery. His life is guided by one thing: to make hers better. Haider Khalaf al-Tamimi accompanied his daughter knowing the scope of the treatment and its limitations. Still, he hopes for the realization of a dream that has remained constant. In that vision, his daughter is not a sickly child slumped in a wheelchair, unable to care for herself. Instead, Noor stands tall -- a young woman, strong and beautiful, walking with open arms toward her father. Haider has not allowed himself to wish for life's extravagances; he considers himself fortunate just to survive each day in Baghdad. But this dream gives him strength. He kisses Noor's dimples as nurses pump propofol through her veins and then whisk her away behind closed doors. Haider settles into a hard metal chair, his head bowed low. He can do nothing now but wait. For the first time in the 11 years I have known him, I see him cry. 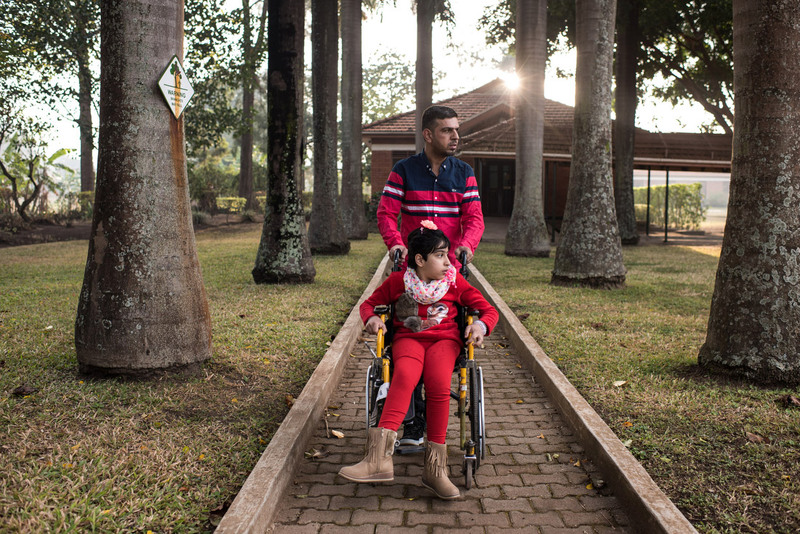 On a December day in Baghdad, Haider and Noor received an offer of help from a land they had never heard of: Uganda. They looked it up on a map and were happy to learn that it wasn't as far away as America. Haider felt both relief and anxiety. Noor's trip to the United States for life-saving surgery was a decade ago. Since then, he had not been able to access the kind of follow-up care a child such as Noor needs. So many of Iraq's medical specialists fled the country, and hospitals are without staff and resources. Noor has to be catheterized to relieve herself and she often develops urinary tract infections. As she's gotten older, debilitating headaches have kept her home from school. 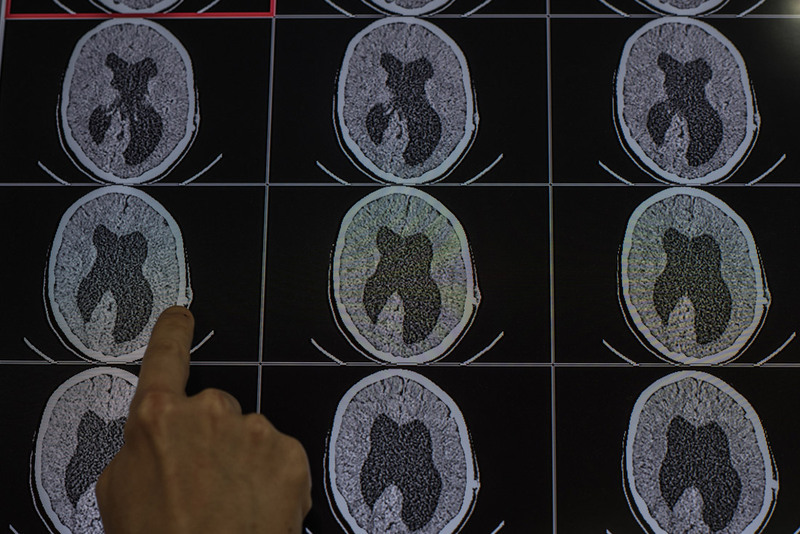 Haider knows that without proper monitoring, there is a chance she might suffer brain damage. From the time Noor was only 3 months old, I've watched Haider worry about her. He's seen Noor cry when boys on the street made fun of her limp legs, her feet contorted in unnatural positions and dangling off her wheelchair. He's heard Noor yell out of anger and frustration when her stepbrothers and cousins ran up the stairs at home to play and she was left alone. 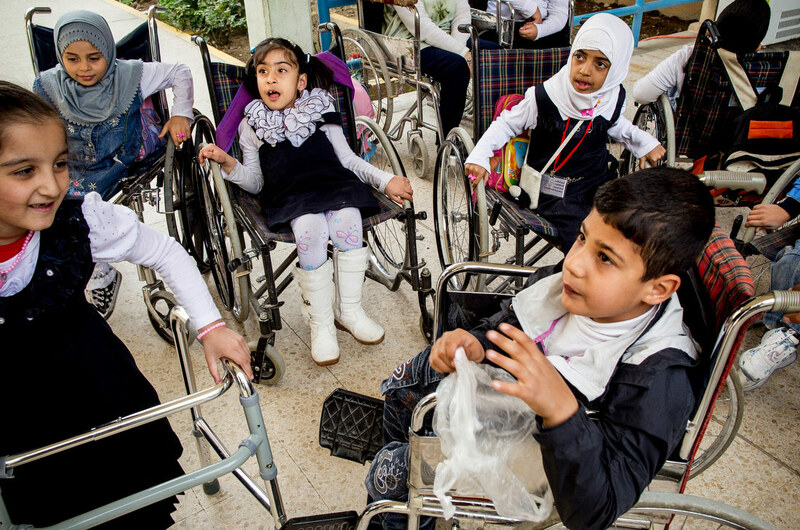 Noor al-Zahra Haider is growing up with disabilities in a war-torn land. Desperate for care, she and her father traveled to a hospital in a remote part of Uganda, a place that felt alien to them in many ways. Teachers told him his daughter is bright, but no public school would take her. He couldn't afford a private education. So he is forced to send her to a special school for the disabled with lower educational standards. 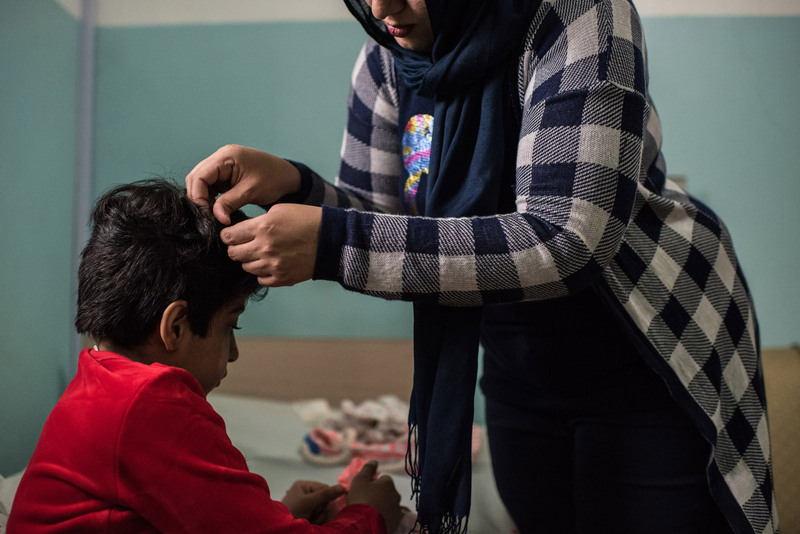 Every morning, he puts Noor in a minivan long before the sun rises, before the streets of Baghdad turn menacing, so she can sit in classes with children who've lost limbs in the war or suffer from severe cognitive ailments. Haider worries about his daughter just as he worries about the future of his country. Answers once seemed within grasp, but problems kept mounting. He felt as though he were gazing into a crystal ball and yet, none of the images shone clear. The hospital in Uganda treating Noor serves as an oasis for children with a life-threatening ailment. He knows life is hard enough for women in Iraq. For one with physical limitations, things could be that much tougher. Will any man marry her when she is grown? Who will take care of her when he is gone? 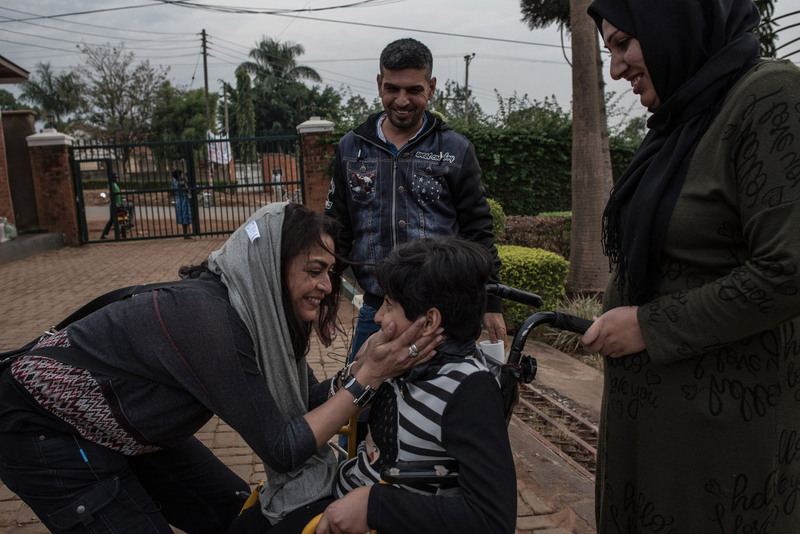 So when a hospital in Uganda agreed to treat Noor, Haider felt he could not say no. He imagined a big, shiny hospital like the one in Atlanta that had set his daughter on a path to survival. Childspring, the Atlanta-based charity that helped sponsor Noor's trip to America in 2006, arranged the visit to Uganda, but Haider was full of questions. We talked by phone in the days before he left Baghdad. He told me it would be an arduous trip for Noor but worth it if doctors could help her. "It will be good if you can come to meet us," he said. "You have seen her from the beginning." That beginning seems so fantastical to me now. In 2005, the year Noor was born, I was a newspaper reporter embedded with a Georgia Army National Guard infantry unit patrolling Abu Ghraib, the town just west of Baghdad notorious for its high-security prison. The soldiers of Charlie Company were attached to the storied 10th Mountain Division and had seen combat for seven long months. They were exhausted by a guerrilla war that at times seemed futile and intractable. They couldn't tell friend from foe; trust had become a scarce commodity. On an uncomfortably chilly night two weeks before Christmas, the soldiers burst into the home of Haider's father during a routine raid. They searched the rooms, rounded up the men and questioned the family. Haider's mother, Soad, spoke to them through an Army translator. She was the backbone of the family, strong and unafraid to carry her tribe through difficult times. She harbored little love for the Americans, who had accused her eldest son, Bashar, of firing a rocket-propelled grenade and detained him at Camp Cropper near the Baghdad airport. Her neighbor was hit by an American bullet intended for insurgents. And a US tank rolled over a kiosk she used to sell groceries at the local market. But Soad realized that moment was her only chance to help her ailing granddaughter. 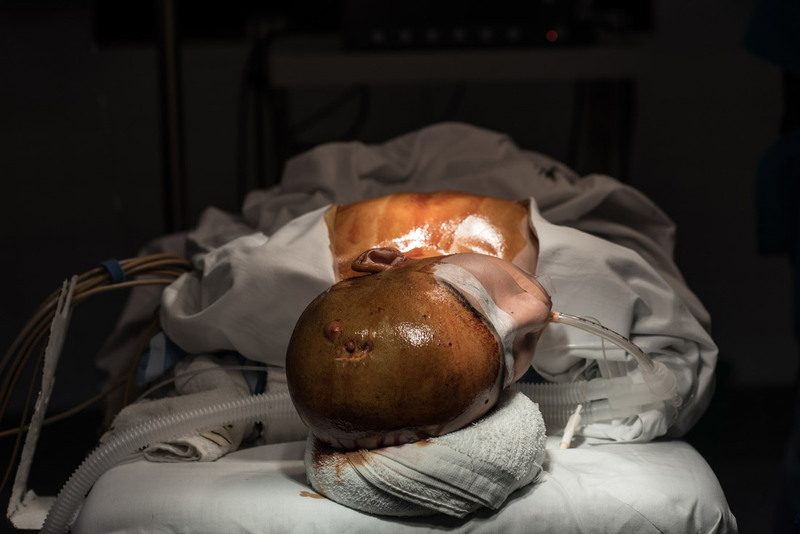 She mustered up her courage, picked up Noor and turned her on her belly, revealing a purplish tumor on her back one-third the size of her body. "If you want to help Iraq," Soad blurted out to the soldiers, "you will help her instead of bothering the innocent." That was my first image of Noor. Even in the midst of Baghdad's carnage, it was shocking to see such a deformity in a baby. Noor would be a burden to her family in Baghdad and it was better to let her die, Iraqi doctors advised. Noor was not yet 3 months old, the first child born to Haider and his wife, Iman. They had been trying for two years to conceive and were overcome with joy when Iman learned she was pregnant. But days before the birth, doctors warned the young couple that something was wrong. After Noor was born, pediatricians at Baghdad's Yarmouk Hospital told Haider his daughter was defective. They had no treatment for spina bifida. Even if she survived, they said, she would be nothing but a burden, especially in the midst of war. Better to let her die, they advised. But Haider would have nothing of it. He named his baby Noor, which means light in Arabic. He was determined to help her. He just didn't know how. I saw him as a quiet man who, at 24, lacked the fortitude of his mother; he was not ready to assume the enormous responsibility of raising a daughter with disabilities. Haider's sister Ghufran helps Noor get dressed one morning before the surgery. Noor grew close to her aunts after her mother left the family, and Ghufran accompanied her to Uganda as a caregiver. But Soad's audacious plea stirred something in the soldiers. They acted to save Noor's life. Surreal scenes unfolded at the height of the Iraq War: American soldiers in full battle gear clandestinely drove heavily armored Humvees and Bradley Fighting Machines in the dead of night to Abu Ghraib, evading sniper fire and roads laced with improvised explosive devices, and slipped away with an Iraqi child, her father and grandmother. I sat with Soad, Haider and Noor in a dusty Humvee as the soldiers broke convention and brought the Iraqi family onto a vast US military base adjacent to the Baghdad airport. Every day at Camp Liberty, as the family waited for whatever would come next, I helped Soad tend to Noor in the family's trailer. I found it amusing to see hardened infantrymen take turns with a milk bottle and convoy out of the base to buy diapers. Their commanders, meanwhile, worked diplomatic and military channels to clear the way for Noor and her family to fly to the United States. It was not easy to secure visas for Iraqis at the height of the war. On New Year's Eve, I watched Noor, Haider and Soad soar into a cloudless Baghdad sky. They left for America with great hope and as much trepidation. They were keenly aware their association with the United States might come back to haunt them in Iraq. But the way they saw it, there was no choice. It was a matter of life or death for Noor. All these years later, Haider was again leaving Baghdad with Noor. Again, he felt there was no choice. At 35, Haider has survived a mandatory stint in Saddam Hussein's army, the 2003 US-led invasion, the rise of al Qaeda and, most recently, ISIS. He knows he could easily have been in the city's Karrada neighborhood last July when a massive bomb ripped through a shopping center packed with Ramadan revelers and killed nearly 400 people. Noor loves fashionable clothes, and the malls are one place where she can be wheeled around. On a late January day, he looked at his daughter, dressed to perfection for their trip in a black-and-brown plaid woolen cape, matching derby hat and fringed suede booties. They said their goodbyes to the family, and Haider carried Noor to the taxi he began driving after he abandoned his failing sidewalk produce business. He doesn't particularly like carrying strangers around Baghdad. Every morning, before he leaves the house, he kisses Noor, his two sons and his wife, brothers and father and tells them he loves them. This has become as routine as the uncertainty gripping their lives in a city that still suffers from bloody bombings. Haider never assumes he will come home alive. Noor was born with a congenital defect that prevented her spinal cord from fully developing. As a result, she has no sensation below her waist and is prone to fluid buildup in her head, as these CT scans show. He climbed into the taxi with Noor and his sister Ghufran, who agreed to go to Uganda as a caregiver. Noor is almost a teenager now. Cognizant of the changes in her body, she's grown increasingly embarrassed by her dependence on others. She lets only a few people close to her: her aunts Ghufran, Hijran and Zainab and her stepmother Fatima. Noor's mother left the family when Haider and Noor were in America, and Noor began calling her aunts and stepmother Mama. With Haider and Mama Ghufran holding her hands, Noor settled into a window seat on the Boeing 737. The last time she flew, Baghdad's commercial airport, named after Saddam Hussein, stood like a dinosaur, a relic of a regime past. She'd taken off instead in a US Army C-130, asleep in her grandmother's lap and blissfully unaware of the attention showered on her and the attention that was to come. This time was so different. She was out of the spotlight and curious. "Where are we going? Is it like America? What will the doctors do to me? Will I be able to walk?" Almost every day, Noor raises her limp legs with her hands and asks when she might walk. The hardest thing for Haider is to watch Noor try to process the severity of her problems. It is also hard for him to provide explanations grounded in reality. The answers are crushing. So he lets her hope. He lets himself hope. Father and daughter took off for Entebbe with their dreams intact. I keep two photographs tucked in a clear flap in my wallet. One shows my mother, who died in 2001. The other is of Noor at age 6. "I am glad you are coming to Uganda," she'd told me in a phone call a few days before she left Baghdad. "I am glad you are coming to see me." I look at the tiny photo in my wallet on my long flight to Entebbe, almost in disbelief that it has been 11 years since I first saw her. Noor might not have survived without the American soldiers but she faced a lifetime of struggle in Iraq. Over the years, I'd written several stories and with each, I came to understand the significance of Noor. For the soldiers of Charlie Company, many of whom were fathers themselves, the little Iraqi girl offered a chance at a tangible victory in a war that seemed to be going nowhere. It was important for them to engage in an act of humanity. Noor arrived in Atlanta as somewhat of a celebrity. Pictures of her smile lit up newspapers and appeared on television stations. She was a sliver of good news at a time when public support for the Iraq War was waning. Doctors at the state-of-the-art Children's Healthcare of Atlanta performed a series of operations to realign and close her spinal column and release congenitally shortened tendons and overly tight ligaments in the back of her left ankle. Then, Dr. Roger Hudgins, a pediatric neurosurgeon, inserted a shunt to drain the excess cerebral fluid collecting beneath the outer membrane covering Noor's brain. Everyone involved with Noor had the best of intentions. But no one had fully thought through the future. 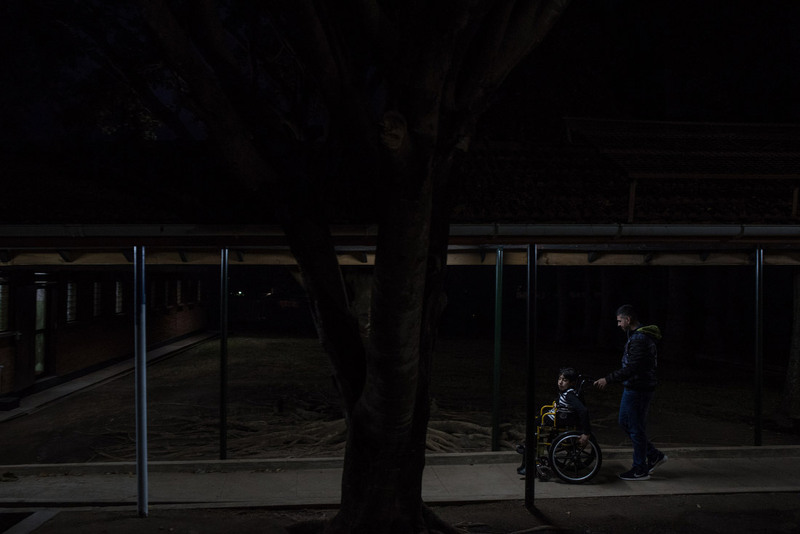 What would life be like for a child with severe disabilities in Iraq? She would be a broken girl in a broken land. An unfinished miracle: Before Uganda, CNN's Moni Basu caught up with Noor in 2013, just before the 10th anniversary of the Iraq War. She was 7 then and her problems were worsening. Hudgins warned Haider that Noor would need a lifetime of medical monitoring. The doctor was also direct in telling him that Noor would never gain use of her legs, though he could not bear to dash his yearning for a miracle. "I'm not here to take away hope. Time will tell." Haider and Soad left America after three months. Noor remained with hosts in Atlanta until she finished her treatment, then was flown back to Iraq. For the soldiers and Noor's caregivers in America, her story ended. But for Noor and her family, it was just the beginning -- the beginning of a difficult life. Just as they had feared, Noor's family paid a price for accepting American help. Their shop in the market was bombed, and Haider said he was abducted twice and held for ransom by men he thought belonged to al Qaeda in Iraq. The first time she had surgery in Atlanta, Noor was a media celebrity. 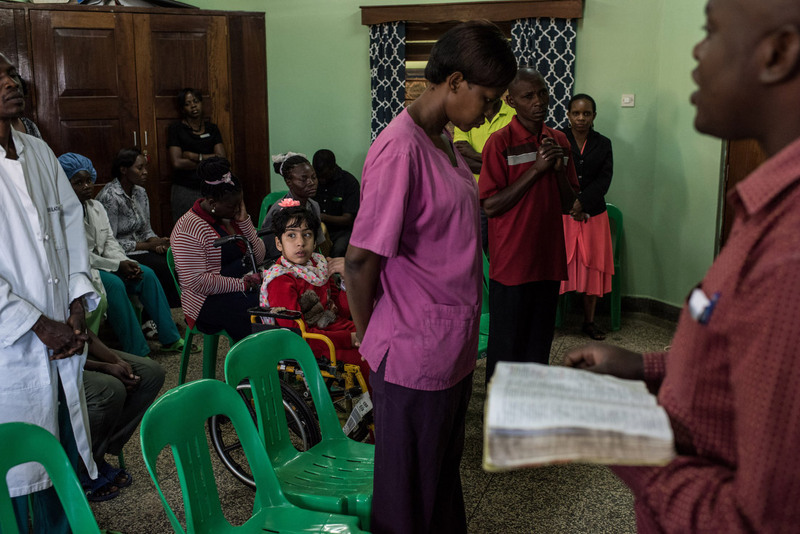 This time, she is quietly treated at CURE Children's Hospital of Uganda, run by an American faith-based charity. Haider told me his wife, Iman, never bonded with their baby. In some ways, she blamed herself for giving birth to a disabled child. After their divorce, Haider got married again to a longtime friend, Fatima. Sectarian strife forced the family to abandon Abu Ghraib and move into a more humble house in a largely Shiite neighborhood in Baghdad. Noor's grandmother, Soad, died in 2008, but she took care to save a scrapbook she'd compiled with all the newspaper stories about Noor. For many years now, Noor has been aware of her history, that she is the "Baby Noor" who melted American hearts. She has always talked about the soldiers, Atlanta and even me as though from memory. The photo of Noor that I carry in my wallet is a school portrait she gave me when we last met in Baghdad four years ago. It was the 10th anniversary of the Iraq War and to me, she served as a metaphor: She was someone the Americans saved, just like they saved Iraq from Saddam Hussein. But then she was left to figure out a future for herself. I am eager to see Noor again, and the car ride from Entebbe International Airport to the eastern city of Mbale cannot go fast enough. It takes 10 hours to travel 160 miles on a pot-holed, traffic-jammed two-lane highway. It's the same herky-jerky journey Haider, Ghufran and Noor made four days earlier, peering out the window as though they'd landed on another planet. Haider had expected spotless roads and neatly manicured mansion-size houses such as the ones he saw in Atlanta. Or grocery stores that offered a dizzying array of frozen foods and produce aisles where automatic misters kept cucumbers and baby lettuce leaves moist. Instead they traveled through a landscape of lush savannas, banana trees and villages with round huts and thatched roofs. They passed through towns with muddy open-air markets and loud signage advertising everything from prepaid cellular cards to Coca-Cola and HIV prevention programs. The CURE hospital is nothing fancy -- a collection of airy brick buildings set amid palm trees. But doctors have developed innovative procedures to treat children like Noor who are suffering from hydrocephalus, or fluid buildup. Their destination, CURE Children's Hospital of Uganda, is run by an American Christian charity and operates with a motto of "healing the sick and proclaiming the kingdom of God." It specializes in treating children with spina bifida and hydrocephalus, the medical term for excessive accumulation of fluid in the brain. The doctors here gained worldwide recognition for practicing an innovative procedure that is shuntless and therefore less prone to infection. This is one reason Noor has been brought here. She has not seen a neurosurgeon since her time in Atlanta and doctors in Baghdad were clear: Take her out of Iraq. When I last saw Noor in 2013, I'd accompanied her to see her pediatrician, Dr. Saad Nasser Hewady, who has been examining her for the past six years. He told me then that Noor's headaches had worsened but it was impossible to know the extent of the problem by looking merely at CT scans. Noor was 7 then and already embarrassed by her bathroom needs. The family was forced to use single-use catheters multiple times because they were unavailable in Baghdad. "I am disappointed with myself. I wish I had left Noor in America." Sometimes, Noor could not stand to be around normal children. She once had a fight with one of her cousins who told her: "I am better than you. I can walk." Haider fretted not only for Noor's physical disabilities but he'd grown increasingly concerned about her mental state. 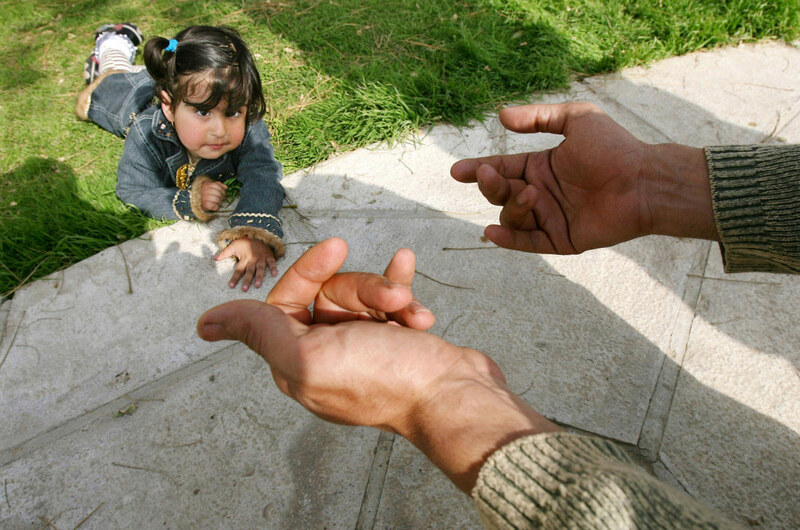 He begged me: "Please, take my daughter to America. She needs help." After the 2013 CNN story on Noor, Childspring, the charity that had sponsored her medical treatment in Atlanta, raised enough money to send a new wheelchair as well as a supply of catheters. It also renewed efforts to pair Noor with specialists. But the logistics of taking a child out of Iraq were tricky and the nonprofit agency's budget was limited. Finding a suitable hospital willing to provide pro bono services proved difficult. The agency stepped up its efforts in recent months after it became apparent that Noor's internal infection required immediate treatment. 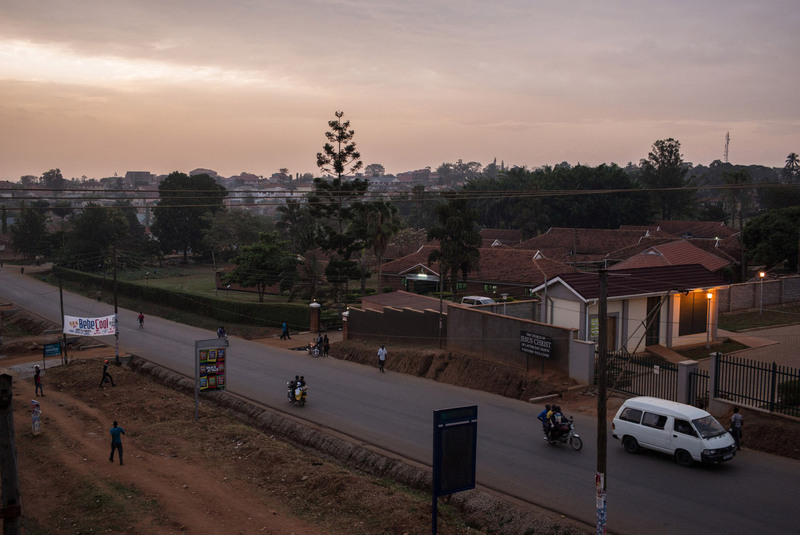 It's almost dark when I finally arrive at the CURE hospital in Mbale, a collection of simple and airy brick bungalows with white-washed walls and young patients the color of ebony. Some are sleeping in mosquito nets -- Uganda is where the Zika virus originated and where yellow fever and malaria are present. Some have heads many times the size of their stick-like bodies. They look like balloons about to burst. One child rocks back and forth nonstop from the pressure in his head. Another cannot close his eyes and stares vacantly into nowhere. CNN reporter Moni Basu meets Noor after almost four years. Basu has been following Noor's story since the girl was 3 months old. Noor's story again seems fantastical. 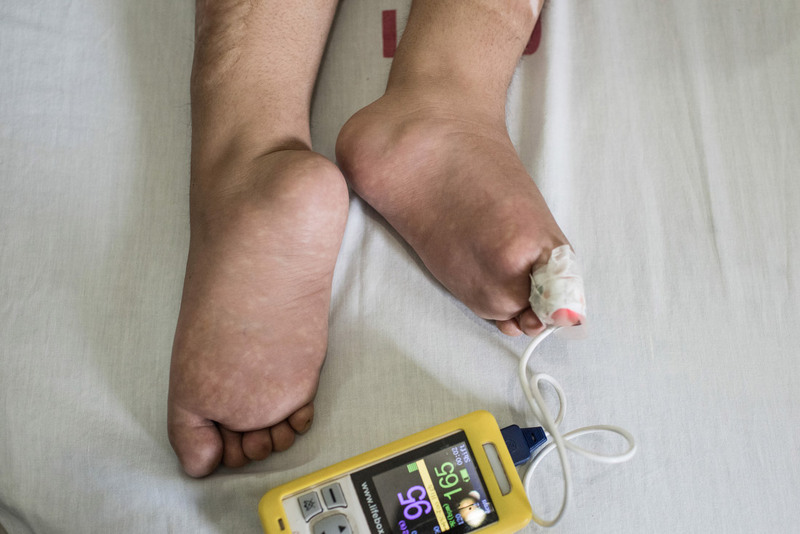 She's an Iraqi girl saved by Americans who has come to this East African city disconnected in many ways from the world, to a hospital that at first appears an unlikely place for complex surgery. I get ready to ask a guard for directions to Noor's room, but I turn to find her waiting for me. 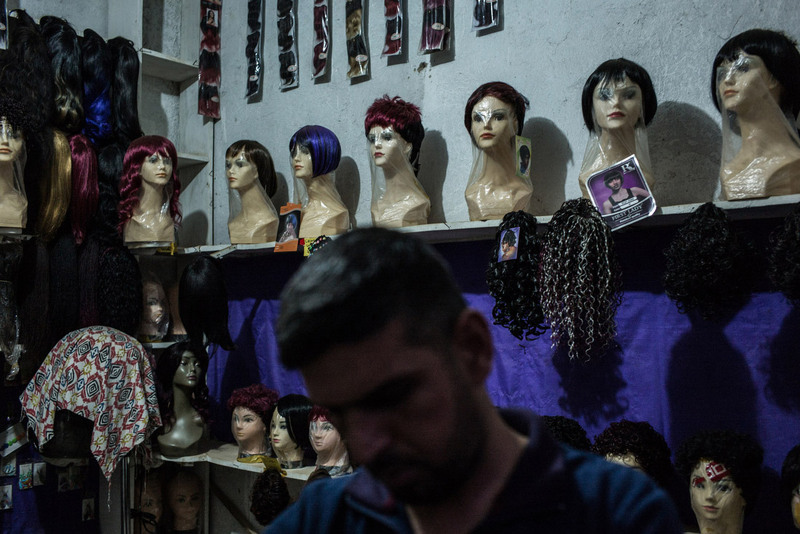 Her aunts in Baghdad have already chopped her long hair in anticipation of what's to come, and she has it pinned back with a pink clip. I can see scabs on her head as I bend to kiss her. I marvel at how much she's grown; she's too big for the wheelchair sent to her four years ago. How silly, I think, that I still refer to her as "Baby Noor." But how incredible that I am here for another pivotal moment in her life. Childspring arranged to pay for two rooms at the hospital, but Haider, Noor and Ghufran want to be together. In Room No. 2, Noor and her "mama" squeeze into a railed bed every night, and Haider sleeps on a vinyl foldout chair. The small room with dulled terrazzo floors and an attached bathroom is to be their home for the foreseeable future, two weeks at the very least. The hospital's medical director, Dr. Peter Ssenyonga, has already examined Noor, taken new scans of her head and prescribed antibiotics to clear the infection caused by the old shunt. He is not sure yet about the surgical options, and with each passing day, Haider grows more anxious. He smokes to relieve stress and quickly exhausts the supply of Esse cigarettes he brought from Baghdad. Every morning, he and Ghufran wheel Noor to a covered outdoor cafeteria next to the hospital's small kitchen. Worried that the food here is not halal, Haider decides to go to the market to buy bananas, bread, eggs, tomatoes and tea. He spends $500 for groceries and thinks Uganda is expensive -- until he figures out he has been cheated out of change. On this morning, Ghufran offers me a plate of scrambled eggs and tomatoes. Haider tells me he has too much time to think. The days are long this close to the equator. Haider often is filled with regret and wishes he had left his baby girl in the United States where she might have had access to better care and a chance for a normal life. "I am disappointed with myself," he blurts out after breakfast. "I wish I had left Noor in America, with Nancy." Nancy and Edward Turner hosted Noor and her family for many weeks in their suburban Atlanta home. Nancy is the one who escorted Noor back to Kuwait so that the US Army could return her to Baghdad. "I selfishly wanted Noor to come home to Baghdad," Haider says. "But America would have been better for her." He knows children with spina bifida can lead close-to-normal lives in medically advanced countries such as the United States. Noor could be going to a better school and have access to a neurosurgeon and a gastrointestinal specialist. He doesn't see anything but bleakness in Iraq's future and laments raising children there. His words grow heavy with regret. "I feel Noor could have fulfilled her dreams in America," he says. "She wants to be a lawyer or a teacher. She wants to help others. But we don't have good education in Iraq anymore." He mentions Roger Hudgins, the neurosurgeon who operated on Noor in Atlanta. Hudgins told Haider that Noor could be anything she wanted, that she could become Iraq's first woman president. "Maybe she still can, but I no longer wish it," Haider says. "It's so dangerous. She will be killed in Iraq." When I last saw her in Baghdad, I noticed a sadness about Noor that tainted even the smile that once enthralled the public. I can see the same sadness blanket her here in Mbale. "Do you think she is happy?" I ask Haider. "I don't know," he replies. "She is so sensitive and falls sick easily. The other thing is she never got her mother's care." Noor's aunts occasionally take her to see her mother, Iman. Noor wants so badly to be loved by her, but Haider says Iman chooses to remain disconnected. He says Iman doesn't even know Noor is about to have surgery in Uganda. The staff at the CURE hospital gather to pray several mornings a week. Noor's family had never seen singing and dancing at a religious service. Noor spends most of her time at the hospital video chatting with Fatima and her aunts on Viber and Facebook and playing games on her Samsung phone. "Fruit Burst" is her favorite. But she's also keenly aware of what is being said around her. Noor seems at once childish and wise for her age. She has grown up somewhat sheltered, but Ghufran says Noor is the one who consoles her aunts when they've had a spat with their husbands. I glance at her, sitting away from earshot in the corridor with paper and pencils in hand. She likes to draw pictures of the Iraqi flag. And butterflies. "My daughter is my hope and my future. Everything I do is for her." I wonder how much Noor comprehends of the situation in her homeland, of her own situation. Haider tells me Noor has seen other children born with spina bifida in Iraq who suffer from hydrocephalus. A relative's infant daughter, Seba, died three months ago. Noor keeps a photo of her on her phone. Haider and I continue our conversation through my translator, Akram Hazaea, the 24-year-old son of Yemeni immigrants who settled in Mbale many years ago. 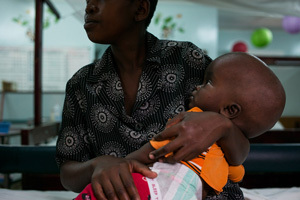 Akram's niece also suffered from hydrocephalus and was operated on here at the CURE hospital. I can see he feels a bond with Haider. Haider tells Akram he was taken aback when he first arrived at the hospital. It seems so rustic. He compares it to the facilities he saw in Atlanta and fears Noor could end up like some of the children in the wards. Tim Erickson, a father of three from Massachusetts who is the executive director of the hospital, joins us in our conversation and tries to put Haider at ease. "I am glad you made it. It was a long journey," he says. "Is Noor able to go to school in Baghdad?" "Yes. But she fell ill during her exams and so she's having to repeat a year." Haider did not tell Noor the scope of her surgery, but her anxiety is plain to see as the day draws near. Haider pauses before asking the question always burning in his mind. "Have you ever seen a case where someone has been able to walk again?" "I think it depends on where the growth is," Erickson says. "This would be something to ask the doctors. I think it's God's decision. "Frankly," Erickson says, "the fact that Noor's shunt has worked so long is a miracle." "Yes," says Haider. "My daughter is my hope and my future. Everything I do is for her." On the morning of Noor's surgery, Haider cannot bear to tell her the whole truth. Nurses have directed him to take her to a barbershop in town to get her head shaved. Noor thinks they are going to a beauty salon like the ones she sometimes visits with her aunts in Baghdad. But it doesn't take long for Noor to recognize her fate. Tears stream down her face as mounds of hair fall to the floor. Haider cannot bear to see her this way and stands in front of her, desperate to block her reflection in the mirror. Ghufran holds her phone close so that her stepmother and aunts in Baghdad can see. The women are crying. Noor is howling. "Why is he cutting it all off?" she cries. "Baba, take me out of here." Strangers peer inside the shop to see what the commotion is about. A small crowd forms to watch the heartbreaking scene. I ask Akram to run across the street and buy a scarf so we can cover Noor's head, exposed now with its many scars and imperfections. Ghufran helps wrap the orange and blue scarf, and Haider carries her back to the van. On our return to the hospital, Haider holds his daughter in his arms. He is no longer the shy young man who walked in his mother's shadow. He is not afraid to show his love for his daughter, though that might be considered unmanly in Haider's world. During surgery, Noor's doctor decides to remove the shunt placed in her head when she was a baby. It had disintegrated and was causing painful infection. At 11:15, nurses arrive with a stretcher to take Noor to the operating room. The moment has finally arrived. Amid Noor's screams and Haider's tears, a nurse grabs my shoulder. "Tell them to pray for their baby," she says. In that moment, the images of Noor's story burn brilliant in my mind, as though it all happened just yesterday. The nurse cannot know the family's incredible journey. "They have been praying for her since she was born." 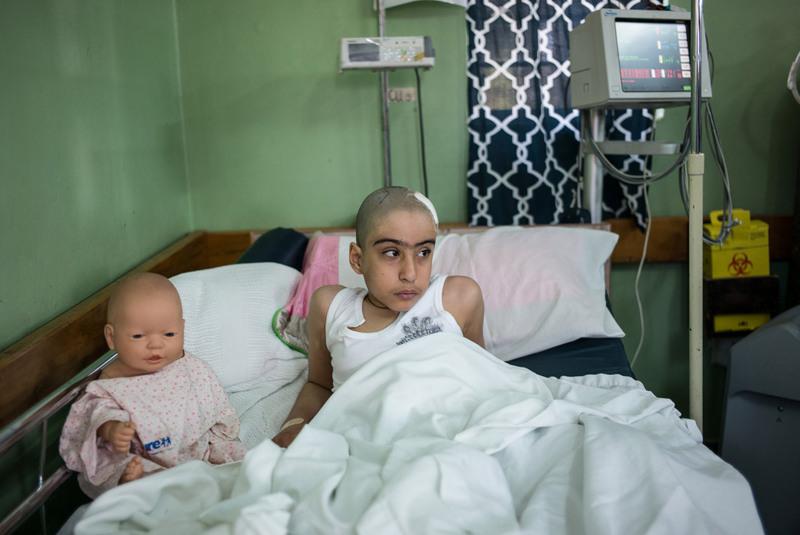 In the hours after the surgery, Noor is transferred to a bed on the far end of an intensive-care unit filled with children who have undergone similar brain surgery. She is the only patient from a non-African country, and the nurses have developed a special affection for "the Arab girl." They make up for their inability to communicate in words with their generous smiles. Noor was a broken girl in a broken land. Now she was getting another shot at survival. The anesthesia has made Noor woozy. She's been vomiting her food, and Ghufran and Haider don't always get the bucket to her bed in time. "Baba, I want you to take me out of here," she wails to Haider. When she drifts into sleep, I see Haider examining the bandage covering the stitches on Noor's head and gently gliding his fingers across her cheeks. Then, he asks Akram, the translator, to take us into town. There, we stop at a small shop and under the glare of fluorescent tube lights, we inspect at least a dozen wigs for Noor. Haider decides to buy a short bob cut, and we move on to our next stop: Chicken Papa, Mbale's version of KFC. Akram assures Haider that he knows the owner and the food is halal. Our last stop is at a supermarket so Haider can buy cigarettes. He's been in Mbale for six days and smoked all the packs from Iraq. Haider heads out to the central market in Mbale to purchase a wig for Noor after seeing his daughter so traumatized by her shaven head. The errands divert Haider's attention for a while, but back at the hospital, he's impatient to speak with Ssenyonga, the medical director. Haider still does not know whether the surgery was a success. The doctor visits Noor the next day after she has been transferred back to her regular room. He explains to Haider that he removed Noor's shunt, which had disintegrated and caused pockets of pus to develop in her head. That is why she had suffered from constant headaches. "How are you?" asks Ssenyonga, shaking Noor's hand. Haider tells the doctor that Noor doesn't feel well. "If I were to go from Uganda to Iraq and then went through all this, I, too, would be sick," Ssenyonga says, smiling in his scrubs and a Barcelona football cap. Ssenyonga doesn't talk much, but when he does, every word matters. He understands Haider's anxiety -- he has three daughters of his own. Haider fires off a barrage of questions. "Should she be in bed?" "Why the bed?" Ssenoyenga replies. "She needs to be out. People need to see her smile." "When will you know if she needs another procedure? What if the problems start again after we go back home?" "If she needed a shunt, we'd know it by now," Ssenyonga says. "If there was pressure building, she's start feeling headaches, become drowsy and maybe even vomiting. Her shunt had not been working for a long time. We don't need to operate." "Those were the pockets of pus from the infection. I think she will feel all right." "I am so grateful to you," Haider says. "I've never forgotten Dr. Hudgins. And I will never forget you for the rest of my life." Nurses bring Noor a mannequin on which to practice catheterizing herself. Keenly aware of her own history, she calls the doll "Baby Noor." Again, Haider pauses before asking the question. "Is there any hope of her walking?" The room falls silent. Noor looks away, as she's prone to do when she is the subject of serious talk. She reaches out to Ghufran and wants to chat about other things. "I have been waiting for you to ask me that," Ssenyonga says. He, like Hudgins was years ago, is direct with Haider. "No. She will not walk." 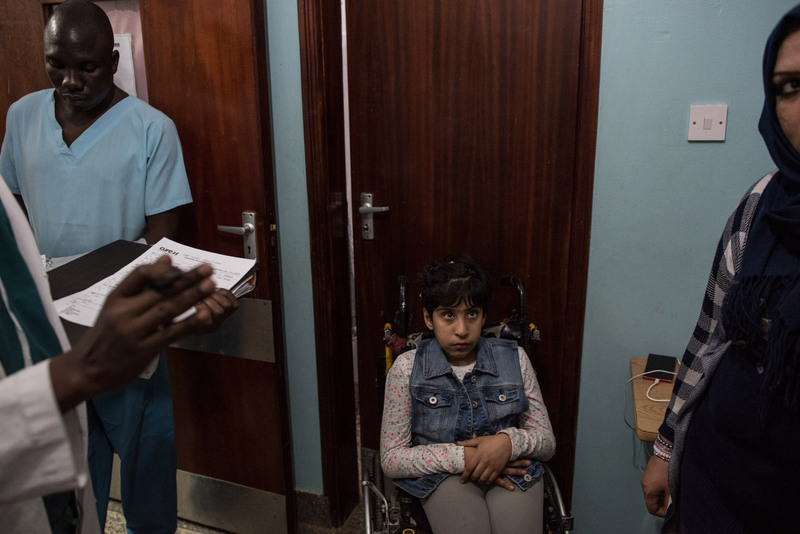 He explains that Noor's brain is unable to make a connection with her legs because her spinal cord did not fully form. "But they told me in America that there might be a technique in the future that could help her," Haider says, desperate to hear a different answer. "That is the hope everyone has," Ssenyonga says. "Inshallah," Haider says. God willing. I can tell Haider is trying hard to hide the disappointment crushing him inside. One day, he believes, God will intervene. One day, when she is fully grown and her bones are strong, she will walk. The doctors told him to discard his daughter. He didn't listen then, and he is not willing to listen now. Everything he does is for Noor. She is his hope and future. On my last day with Noor, we take a Toyota Land Cruiser up to Mount Elgon, a volcanic outcrop that soars some 14,000 feet high above the border between Uganda and Kenya. Noor has never climbed a mountain, or even seen one. We get out of the car at a tourist lodge near Sipi Falls, and Haider takes turns with a couple of guides to carry Noor up a winding dirt path. 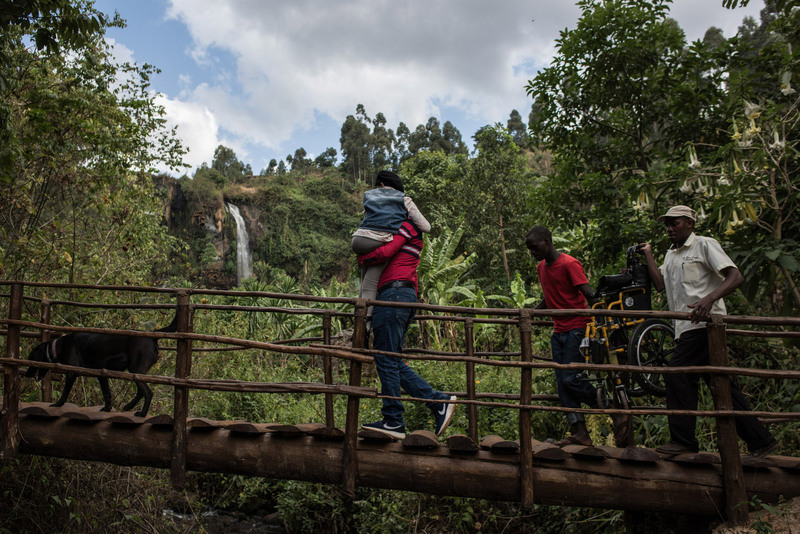 Haider carries Noor up to a waterfall at Mount Elgon. She had never been atop a mountain before. At the top, Noor gazes out from her wheelchair, mesmerized by a waterfall crashing down on the rocks below. She watches her father frolic in pristine pools. I crouch next to her and a silvery mist clings to our hair and skin. This is the highest ground Noor has ever touched, the closest to heaven she's ever been. "It's beautiful here," she says. "I don't want to go back home." How different it is here from Baghdad, I think, where even life's simple pleasures often seem so far out of reach, where every day unfolds with uncertainty. "Will you come visit me in Baghdad?" Noor asks. "Of course," I say, knowing well that many months, maybe years, may pass before we meet again. I can only hope it will be joy and not calamity that brings us back together. We sit for tea on an outdoor bench under amassing clouds burdened with rain. Before we lose the day's light, we start our descent back to the hospital in Mbale. Ahead in the distance, far from the herky-jerky highway, there is something else Noor has never seen before: a rainbow spanning the sky.